Need to find the school that fits your kid? We have the answers you’re looking for at the Austin Alternative School Fair. Read on for all the details! Where? A brand-new venue for our event: Spider House Ballroom, 2908 Fruth Street. Park in one of Spider House’s two parking lots, or in the free street parking in the surrounding area. What? A chance to talk with some of Austin’s most effective, innovative educators from learning communities where children and teens grow and thrive. Each booth has some fun activities to engage kids while parents talk with educators about their schools and special programs, which are tailored to all ages from pre-K through high school. The schools represent unique, transformative programs from all over the metro area, including Cedar Park, Pflugerville, and Dripping Springs. Food and beverages available for purchase next door at Spider House Cafe. How is this school fair different? Unlike many of the larger, generic fairs where schools compete for your attention, this one is a collaborative effort by alternative educators who know there’s not one right way to reach all learners. Is it really FREE? Yep. Just bring your kids and questions! Who is throwing this shindig? It’s brought to you by the Education Transformation Alliance, a 501(c)(3) nonprofit organization, and co-sponsored by Spider House Ballroom and Alt Ed Austin. I’ll be there to chat and help find answers to all your questions about schools and transformative education in our community. And we have a Facebook page you can check out to remind you of the time and place and to share with other parents. Come one, come all, to the Austin Alternative School Fair 2017! Get out your calendar, circle February 25, and rally the kids of all ages! 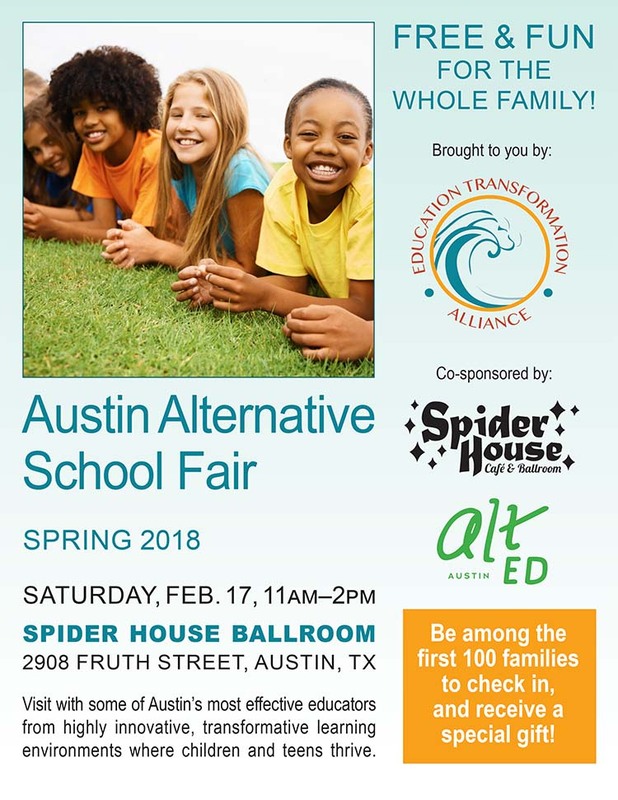 The nonprofit Education Transformation Alliance is joining with sponsors Free Fun in Austin, Whole Foods Market, and Alt Ed Austin to host the annual Austin Alternative School Fair on February 25, from 11a.m. to 2 p.m. at the Whole Foods Market rooftop plaza. Check out the event’s Facebook page for updates over the next few weeks. We like to think we’re doing our part to “Keep Austin Weird” for kids by bringing together highly innovative, creative educators to share information about the number and variety of learning options in our area. Parents and kids will have a chance to meet with the folks who run schools, enrichment programs, and educational services. The fair is set up on the plaza near the playground and features engaging activities for teens and younger kids, including virtual reality experiences, 3D printing, computer games, a mini nature museum, assorted crafts, as well as movement-based fun like sock poi and flow arts. And of course, there will be healthy food and drinks for sale from Whole Foods. Alt Ed Austin is proud to sponsor the event again this year. It’s always a chance to talk and share in a relaxed, fun setting. We’re lucky—and more important, our kids are lucky—to have such a caring community of educators. Austin Alternative School Fair 2016! Mark your calendars for February 20th, and plan to bring your whole family for a whole lot of fun! Our friends at the nonprofit Education Transformation Alliance are gearing up to put on the annual Austin Alternative School Fair, and I can see already that it’s going to be the best ever. I’m pleased and proud that Alt Ed Austin is sponsoring the fair again, along with the good people at Whole Foods Market and Free Fun in Austin. I always have a great time talking with families at the fair, so please don’t be shy! Come on up to the Alt Ed Austin table and feel free to ask me your burning questions about Austin area schools, from pre-K through high school. If you have kids in the preschool-to-elementary range, don’t miss the special show at noon! Lizzie Samples has been enchanting young audiences and their parents all over Austin with her Happy Face Storytime Performances. This is a perfect chance to see Lizzy enact a beloved children's story, in costume, with her signature charm and artistry. And, just like the fair itself, it's FREE! Thinking ahead to potential hunger meltdowns or thirst-induced doldrums at the fair? The friendly folks at Whole Foods Market will be on hand with healthy snacks and beverages for sale! So plan to stay a while, play, talk, munch, and learn with us. If you have questions for me or any of the participating program directors before the fair, please leave them in the comments below, and we’ll do our best to answer them. Be sure to follow our Facebook event page for updates as we announce more fun, engaging activities for your kids. Join us at the Austin Alternative School Fair! 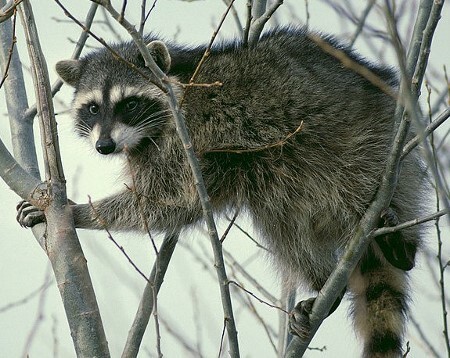 Looking for something fun, informative, and free to do with the kids this weekend? Head over to the downtown Whole Foods rooftop plaza on Saturday between 11am and 2pm. The Education Transformation Alliance is putting on its fifth Austin Alternative School Fair, its biggest and best yet. 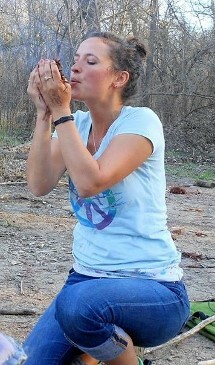 If you have school-aged kids, you’re probably in full-on exploration (and perhaps application) mode this time of year. That’s why you need to bring your family to the fair! With 17 unusual schools and other innovative educational programs participating, you’ll have a chance to learn about many different learner-centered approaches to education. You’ll meet some of the most creative, effective, and beloved educators around and learn how their small, nonstandard and nonstandardized programs can help develop the very best in your child. Alt Ed Austin is thrilled to sponsor the fair, along with the good folks at Whole Foods Market and Free Fun in Austin. Look for me at the Alt Ed Austin table. I'd be happy to answer your questions, help you find the programs of most interest to your family, and guide your kids to fun, hands-on activities they’ll love. I can’t wait to meet you and help you find the right fit for your kid!